The 14th annual Filmed by Bike film festival takes place this weekend, May 6-8, 2016, at the Hollywood Theatre (4122 NE Sandy Blvd). . . .
Portland Guadalajara Sister City Association (PGSCA) presents the 32nd annual Cinco de Mayo Fiesta, May 5th, 6th, 7th and 8th 2016. 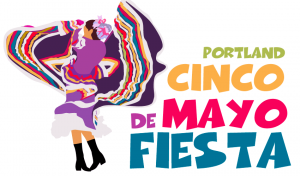 Portland’s Cinco de Mayo Fiesta is the largest multicultural festival in the state of Oregon and is held at beautiful Tom McCall Waterfront Park in downtown Portland, Oregon. Come celebrate with us as you enjoy top entertainment from Mariachi de Ciudad Guadalajara, direct from the city of Guadalajara, as well as Oregon’s very own Ballet Folklórico Mexico en La Piel. View our full entertainment schedule to plan your visit. Funtastic carnival rides are back again this year as well as our Artisan Village, featuring artisans flying in from Jalisco, Mexico to share their beautiful artwork with you. All entertainment is included in your entry fee, including Lucha Libre and Amateur Boxing this year! Check out our Special Events and our FREE fun stuff page to see what else we have in store!